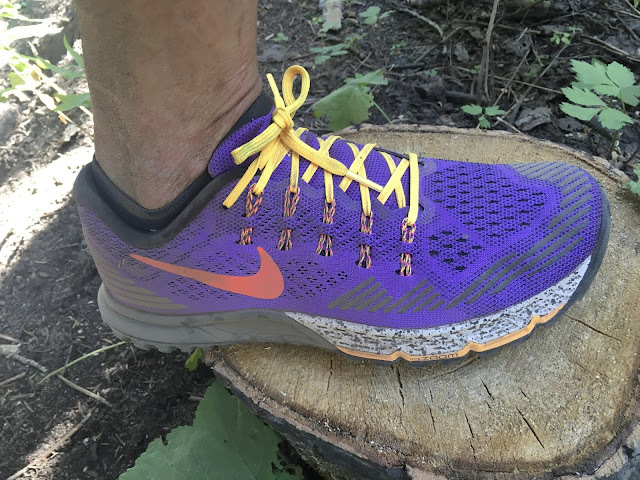 Joining Nike Trail Running's very focused line of 3 products, the outstanding Kiger Vest (review here) and heavier duty Wildhorse 3 we find the Zoom Terra Kiger 3 a light, agile, and well cushioned trail runner packed with innovations. Stack height is 24mm (Heel), 20mm (Forefoot), 4mm drop. At: 9.0 oz/ 255 g (men's size 9), 7.2 oz/204 g according to Running Warehouse it is on the lighter side of trail shoes but has proven very protective and fun to run, with a stable yet at the same time very ground conforming secure ride. an intricate outsole lug arrangement. The upper is relatively dense but well ventilated engineered mesh. The mid foot hold is achieved by a combination of Flywire cords and an unusual tongue construction wherein the top of the medial side tongue is sewn to the upper at the lace up area, followed by a gap, then another connection from tongue directly to the last 4 lace holes. The mid foot hold is outstanding but in no way constraining, again the design theme of conforming to terrain. With the exception of some overlays at the toe bumper to add some structure and along with lateral side to the toe there are no discontinuities in foot hold. The heel counter is unusual as it is wishbone shaped, below the black stripes and across the middle with a soft no plastic window down low where the rear of the heel meets the midsole The heel is surprisingly stable and well held. Breathability has been excellent while at the same time minimal trail debris sneak through. I fitted true to size and most should as well. While the toe box height was snug initially it stretched quickly. The toe area is unstructured, there is no toe bumper per say, watch out! beyond the thin black overlays and quite wide. Wider feet should give this upper a try. The fit reminds me of the Lunar Tempo with a higher somewhat wider non pointy toe area and a more stable heel. 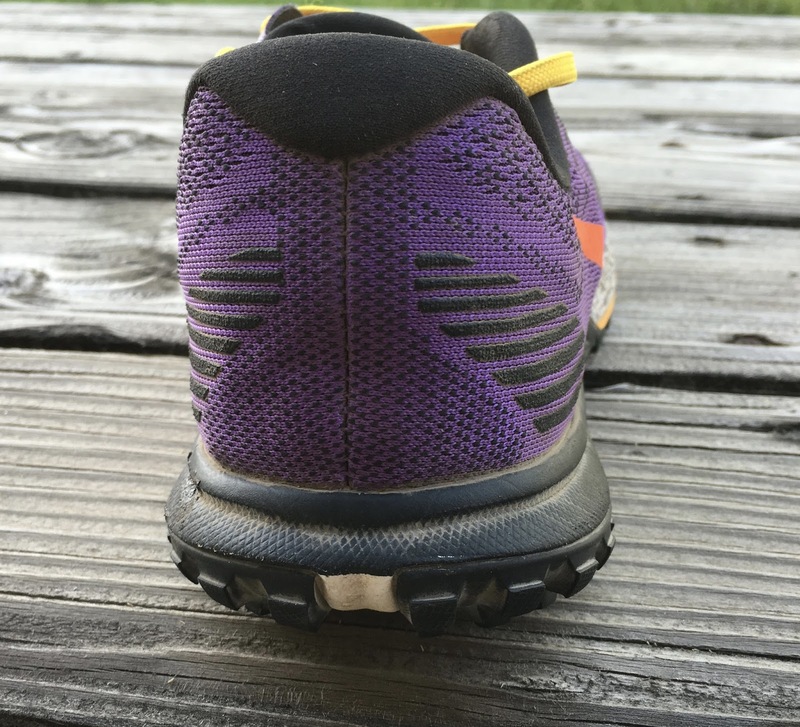 Two Zoom Air units are embedded in fairly firm Pylon at the forefoot and heel, firmer at the heel for reasons which I will explain. The front rock protection from the Zoom Air has proven highly protective, yet at the same time decently flexible. Most especially, it provides a sense that instead of perching on obstacles as conventional rock plates do that the foot conforms to the obstacles. The rear Zoom unit is wrapped in the firm Phylon which provides the stability but unlike most firm trail shoe heels there is no harsh landing and far less shock than usual. It appears that the rear Zoom Air unit extends further towards the edges of the midsole than the front unit and is more convex, higher pressure" to provide more deflection capability and stability. The front Zoom Air unit appears to be narrower which also makes the edges of the front of the shoe softer for better grip and agility. Neat. The rear black midsole and front white appear to be of the same durometer, firmness as upfront the but there are small cuts into the front midsole, which along with what I think is a narrower Air Zoom unit ,make the outside edges along the sides softer with more deflection which leads to a better grip from the outsole. The thin orange layer is cosmetic, paint, but may indicate the location of the Air Zoom unit. Back at the heel the stability is rock solid with an outrigger type heel something I like as a heel striker at slower speeds. 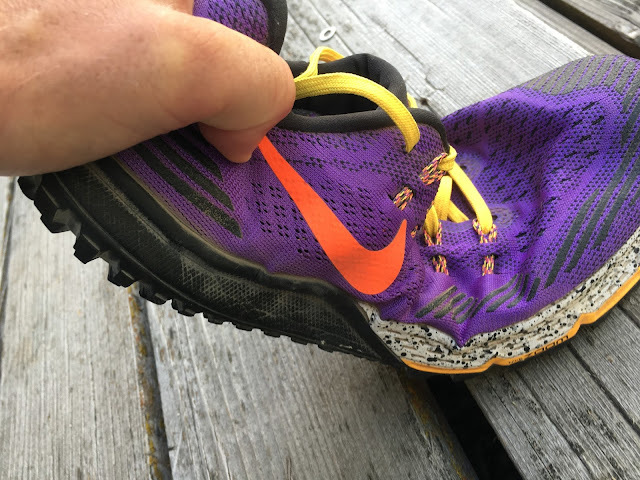 Unusually the flex point is far back near the second to last lace hole. 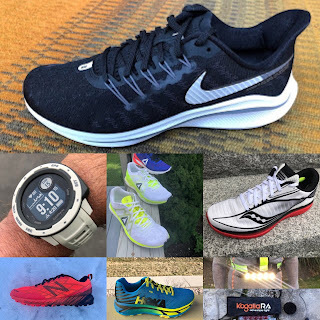 The shoe climbs like crazy as a result and is super stable but on roads feels more awkward and slappy than I excepted with the rear flex point, conforming nature of the outsole and midsole to the road not particularly snappy or responsive. The outer perimeter of the outsole, the black lugs are Nike's 054 Super High Abrasion Rubber with the inner lugs made of 004 Sticky Rubber. The lugs are arranged in a very intricate pattern of sharp angles with generally the front outer lugs angling down towards the front and the rear lugs either vertical or angling at the edge of the outsole outward. Traction has been outstanding on both loose and firm terrain but I worry about delimitation of the outsole from the underlying midsole, seeing already some slight peeling of the heel rubber at the edge of the vertical white midsole (below peeling not illustrated). Somehow Nike has blended an almost moccasin like feel over terrain with cushioning, stability, and agility. The Zoom Kiger 3 has been a joy to run on easier to moderately technical single track here in Park City. Zoom Terra Kiger 3 climbs beautifully and is plenty stable on downhills, something this timid descender craves. This is not a bouncy shoe despite the Zoom Air. The rear flex point seems to favor both climbing and descending. The upper while not ladden with overlays is plenty supportive. The Air Zoom based rock protection conforms to obstacles as opposed to balancing on them. The cushioning, front and back from the dual duty Air Zoom encapsulated in the firmer EVA is a great combination, not to soft but leg friendly and fast. The lugs are never in the way and always on duty. My only surprise to date is that the pavement ride is not great, I thought it might be given Air Zoom and smaller lugs and all. But this is a trail shoe. A few worries about wear of the upper in the forefoot over time but to date like new with 30 miles on them. The outsole is glued into the midsole and I am seeing a tiny amount of delimitation at the heel where the outsole splits left and right, the culprit might be the soft midsole and my heel striking. The Terra Kiger 3 is a light and versatile trail shoe suitable for most technical terrain, although as of yet I have not taken them on wet slippery rocks and roots. It has a particular strengths climbing and descending fast, but with plenty of cushion and comfort all around for long miles. I have found the sensation of ground conforming Air Zoom combined with a relatively unstructured, but super well held upper and great stability, unique in a trail shoe. This is a confidence building shoe without being a near hiker.A bit awkward as a pavement trail hybrid it will stay on trails for me. The relatively unstructured front of the shoe and its width make it a good option for somewhat wider feet where control and good hold is important. Give it a few runs to stretch out at true to size. Highly Recommended. 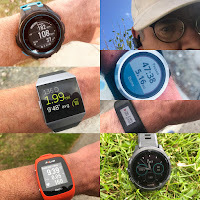 The Zoom Terra Kiger 3 was provided at no cost to Road Trail Run. The opinions herein are entirely the author's. Over 35 in depth Road and Trail Shoes reviews so far in 2016! Thanks for Shopping at the Links Below! Purchases Help Support Road Trail Run.